The Undertaker recently spoke to WWE.com regarding the 20th anniversary of his Hell in a Cell match with Mick Foley. During the interview, Taker recalled just how much worse Foley’s second fall from atop the cage could have been. 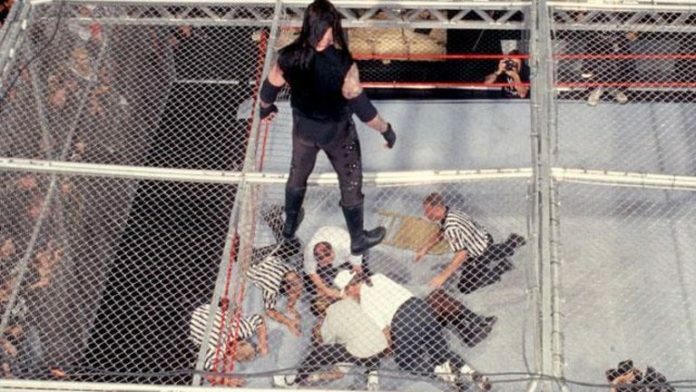 Foley’s second fall was not planned and happened when the panel atop the cage gave way after Taker chokeslammed Foley onto it. According to Taker, he almost ended up falling through the cell roof as well. Taker also mentioned he wrestled the match with a fractured ankle. Just getting to the top of the cage proved challenging.